As the title suggests I am looking for advice for what is historically suitable including the scabbard. Would anything European from the Albion Knecht's time period suit, or should it be Germanic or an even more specific set or parameters? Look at the equipment used by soldiers in pay of Emperor Maximilian I. His body guard were armed with just such Kriegsmesser as the "Knecht" is inspired by. Time frame is very late 15th C to early 16th C (or even mid 16th C). The Nagel on the guard makes it rather earlier in type. Later ones often had broader, shell like Nagel. 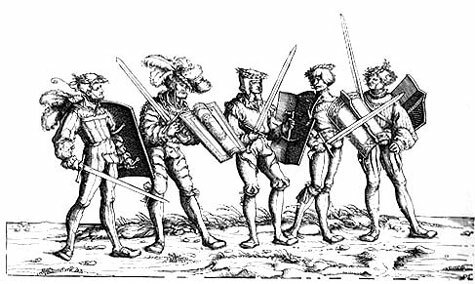 Think early Landsknecht. Not the most flamboyant type yet. Their armour and clothing still retain a lot of 15th C feel to it, but style is showing a definite direction towards the outrageous style of the mercenaries of the 16th C. If you choose the later period for the "Knecht" you can go more flamboyant in style. Go with half armour. Or a combination of skull cap, breast plate and mail. Clothing is beginning to show some slitting. The war knives of this type were most popular in south central and eastern europe. (Bavaria, Austria and Bohemia) Look at armour and clothing styles from these areas. Scabbard is a construction with thin wood slats that are covered by leather. No metal mounts for belt attachment. A basket weave of leather thongs cover the scabbards for the by knives at the top of the scabbard and attach to the belt (a narrow belt!) Chape is a simple flattened thimble. It is a very stylish and proud looking outfit. Thank you very much Peter. It looks like a very interesting kit to create. Interesting that the image shows messers with grips longer than single handed and yet they have shields. I cannot imagine using my Knecht any where near as effectively with one hand as with two.